A thorough study of the Book of Proverbs that covers topics such as wisdom, foolishness, friendships, morality, and ethical problems and solutions. Also lists proverbs arranged by subject. Excellent for youth classes and special studies on Proverbs. 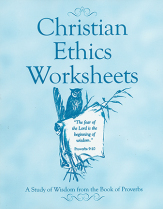 &#160;An attractive book of worksheets for use with Christian Ethics for YOUth. Thought-provoking questions, vocabulary helps, and practical applications help the Book of Proverbs to come alive today with relevant Bible passages for young people. Answer key for the Christian Ethics for YOUth workbook.